Each product serves a purpose for your leasing success, and when combined, powerful analytics are revealed for actionable insight anytime, anywhere. Everything you need to start making data-driven decisions for your properties. The future of leasing is here. Access powerful analytics that integrate seamlessly with your Property Management System (PMS) all from your mobile device or desktop. LeaseHawk products are developed by forward-thinking multifamily experts with a passion and deep knowledge of the industry. Exploring the future of the industry with innovative ideas and leading-edge tech such as predictive analytics and artificial intelligence, is what we do. Track calls to actual leases. Make data-driven marketing decisions based on calls converting to actual leases—an industry first! The at-a-glance dashboards provide full transparency into the performance of your entire portfolio or individual sites, so you can quickly identify areas that need attention. Connect the LeaseTraceTM premium feature for full visibility into your marketing effectiveness. It tracks the original call that resulted in a lease to help identity your most effective advertising sources. HawkEye makes it easy to identify changes in the key areas that impact leasing success. See ranked ad sources by call, prospect and lease volume. Track employee call performance trends and rankings against the industry average. Keep track of all inbound communications, including calls, texts and emails that have not yet been viewed or require a response. View communication volume to optimize your leasing team's inbound to outbound response ratio. Harnessing the data captured from your Property Management System (PMS) and the LeaseHawk software suite, LeaseTrace provides direct insight into which calls and ad sources generated actual leases. Respond to leads in seconds. LeaseHawk’s easy-to-use Customer Relationship Management (CRM) software helps you respond to leads and residents faster than ever before. Whether you’re taking a potential resident on a tour or working from the road, the LeaseHawk CRM keeps you on track to respond fast, collect guest cards and set appointments wherever you are. Receive instant notifications of new leads or new communications from existing contacts, so you can follow-up in a snap. View all your leads in one central, mobile interface. View a contact’s entire communication history to provide a more personal experience. Access real-time unit pricing and availability and generate reserved quote sheets while on live calls without leaving the CRM. Gain visibility into your leasing pipeline to prioritize follow-up efforts and stay on top of assigned tasks. Know your prospect volume, not just calls. 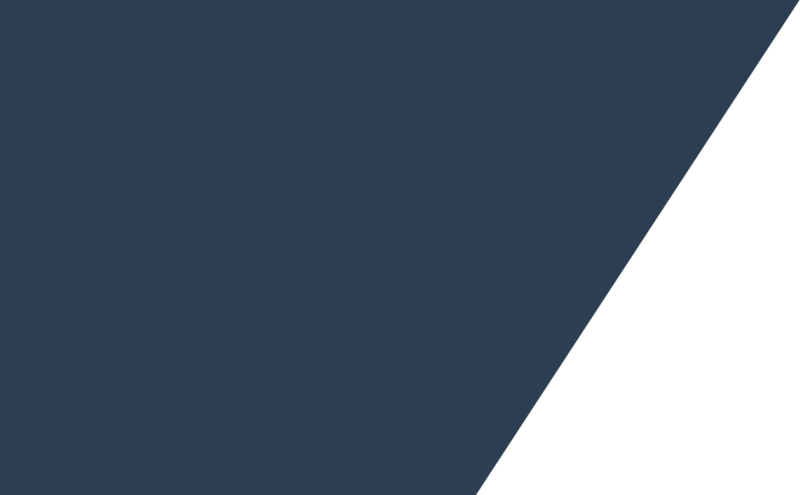 Take advantage of unique CallTrack national toll-free and local tracking telephone numbers to compare the effectiveness of each marketing source and ad campaign. Our Artificial Intelligence (AI) models do the work to transcribe and score each call to determine if the caller was a new or repeat prospect, resident, vendor and more. Your team places the CallTrack tracking in your print or digital advertisements. Potential prospects see your ad and call the unique CallTrack number associated with that source. LeaseHawk routes the incoming call from the tracking number to your leasing office instantly. The ad source and caller data are captured, and calls are recorded in LeaseHawk’s dynamic reporting. Assess crucial, industry-specific data with the click of a mouse. Compare not only calls and leads, but prospects-per-source, cost-per-prospect, and calls-per-day. Get status reports that provide performance accountability. See how many leads and prospects your properties have received and which employee took each call. Manage your caller experience and track your true answer rate utilizing LeaseHawk's voicemail messaging and missed call notifications, interactive Voice Response (IVR) system, overflow, and multi-call and time-of-day routing. Tracks the original source that prompted a call to your property by displaying a dynamic phone number on your website, so you’ll know the true number of leads you received from each web marketing source. Easily visualize your team’s performance. 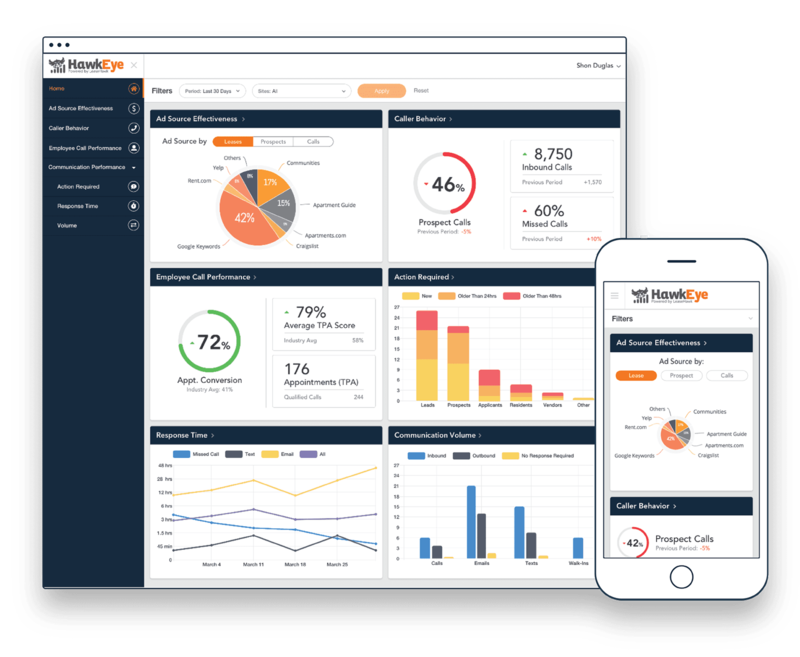 Telephone Performance Analysis (TPA), a service exclusively provided by LeaseHawk, includes trained analysts that evaluate and review your employees’ calls with actual prospects. Each call is scored using a survey of best practices created by industry professionals in the ownership, management, and operation of apartment communities. These scorecards make it easy to identify the areas that need improvement, so you can target your training efforts to improve your team’s performance. Plus, you’ll get a view of how your team compares to the performance of the entire multifamily industry. The Telephone Performance Analysis (TPA) Industry Report Card, researched and published quarterly by LeaseHawk, is an objective report that benchmarks how effectively multifamily professionals handle incoming telephone calls. It provides the key strategic services to enhance your community’s ability to track marketing dollars, increase lead conversion rates, and improve employee performance. The industry's best conversational assistant. ACE (Answers Calls Every time) is the automated and conversational assistant that pleasantly interacts with your callers and answers their questions after hours or when your staff is unavailable. With 49% of all calls going unanswered, ACE offers a modern approach to the traditional call center for today's apartment hunters. 49% of all calls are missed by leasing offices. 52% of callers will not try again if they missed you the first time. Prospects are 4x more likely to converse with ACE than voicemail. 30% of prospect calls answered by ACE in 2018 resulted in a guest card being collected. Listens carefully to each unique caller’s needs and provides the desired information quickly and efficiently. Sets appointments and collects guest card information. Never miss a call, or opportunity. Answers calls 24/7 with a constant level of quality to provide the best customer experience. Supports English and Spanish. Save money and resources as an effective alternative to costly call centers and impersonal voicemail services. Work with our Implementation Team to deploy. Choose the training packages that are right for you. Our team of multifamily experts have designed support and training materials to streamline the onboarding process, so you can easily deploy the solutions right for you. Our services have a variety of learning pathways to fit intuitively within your team's processes. Add-on training packages to develop a specialized LeaseHawk launch plan for your business. Access complimentary training webinars, on-demand videos, and a library of other helpful resource documents. 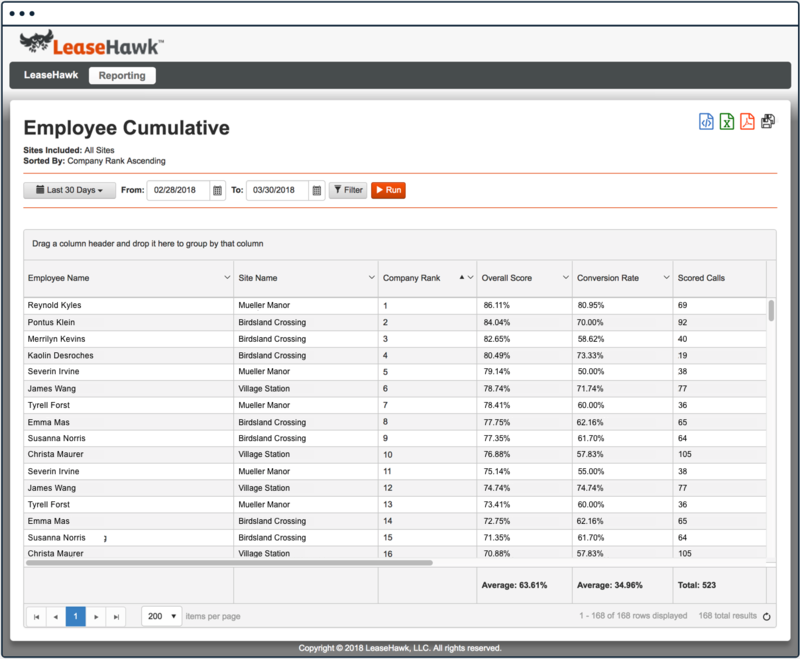 Receive a dedicated LeaseHawk Client Manger as a strategic resource for qualified clients only. Product support from our team of technical engineers at our Scottsdale-based headquarters.